In the fall of 2015, CWGL invested in an in-depth evaluation of the campaign where dozens of participating organizations shared their thoughts, experiences, critiques, and recommendations. 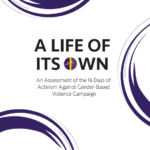 The 2018 16 Days Toolkit is available in both ENGLISH & ESPAÑOL. 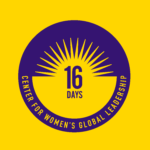 This report chronicles the key discussion points of the Strategic Conversation on Militarism and Violence Against Women, convened by the Center for Women’s Global Leadership (CWGL) at Rutgers University from June 9-11, 2011.